The bell is ringing - a cheerful, light sound accompanies the dance of the sound tubes. Do you also wish an optically and tonally harmonious environment ? This decorative, high-quality, electric doorbell combines attractive design, natural sound worlds and full function. 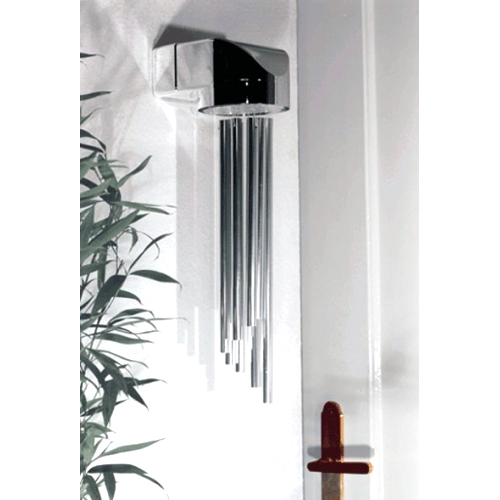 Dimensions: 41 x 14 x 11,5 cm, 16.14" x 5.51" x 4.53"
This design merges sound tubes and cover into one single unit. The adaption of the product to its environment is strongly developed. Effect: This design has an effect of sobriety through its plain lines. The broadcasting of a quiet elegance will be perceived as classic and reassuring. Recommendation: We recommend this design for a majority of different furnishings and home décors relaying on the high grade of adaptation of this type. This design is the magnificent version of OcTavo. Effect: The golden design broadcast warmth and glamour. Thereby the colors of your environment will be selected and rearranged. This will provide a revaluation of the coloring of the room. Recommendation: This Design is suited for 'warm' interiors, which make use of elements like wood, textiles or coloured wallpaper. This design represents the modern version par excellence. Effect: This design will optically separate the doorbell from the wall and stress the unit formed by tubes and carrier plate. The functional aspect of the doorbell is a central issue in this configuration. Recommendation: This colour is suited for modern environments that make use of different shades of black and white and may also comprise some metal or glass components. 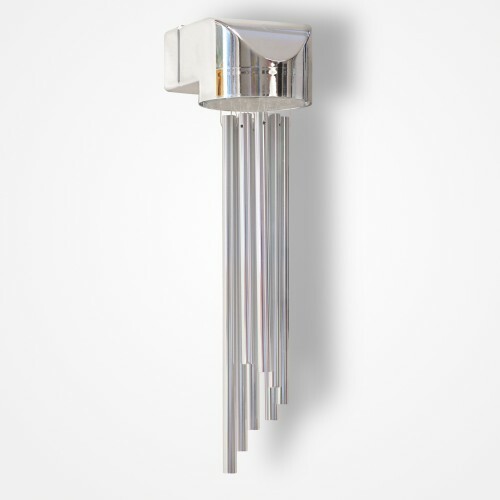 This design represents a fresh version of the silver doorbell. Effect: The mat reflections of the top and of the sound tubes stress the optical unit of both elements. Simultanously the drops of water lead to a brilliance which harmonizes with the surrounding colors and transmits freshness and mobility. Like the dew in the sunrise, this version glitters in the daylight and brightens your entrance. Recommendation: The organic character of this doorbell suits extraordinary well to natural walls, structured wallpaper or textile wall decoration. This design offers an alternative version to the plain gold doorbell. Effect: Due to the glitter of the drops it gives an impression of marmored surfaces. Opposite to the Octavo® Wet Classic version, the effect of the drops generates a comfortable and calm elegance of the lines. The top of the entity creates a festive atmosphere. Recommendation: This version suits particularly well to an environment of antique or dark woods and to curtains or textile wall decoration. doorbell.com © 2019. All rights reserved. Availability, technical modifications, errors and omissions are reserved.